Pheasant is a wild bird with a subtle, gamey flavour and even though it is commonly associated with Christmas, it is in season from October until February. Widely available in butchers during this time, pheasant makes an interesting change to chicken and cooking the breasts sous vide ensures a moist, tender result. For a richer flavour try adding butter to the vacuum bags instead of oil. You could also try adding different flavours to the bag such as rosemary, garlic, peppercorns and even bacon fat. Andy McLeish serves Poached and roasted pheasant with Savoy cabbage, roast parsnips and sherry vinegar pearls, while James Mackenzie serves Roast pheasant breast with parsnip purée, parkin and pickled brambles. 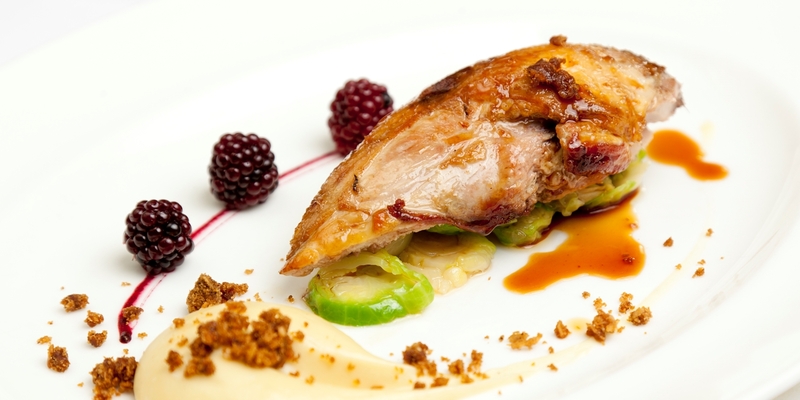 For an Indian twist try Vineet Bhatia’s Achari pheasant, spiced aubergine, caviar and poppy seed pheasant cake.